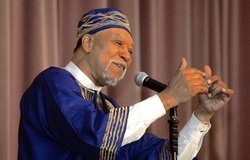 He is the recipient of the National Association of Blackstorytelling (NABS) highest award: The Zora Neale Hurston Award, and the National Storytelling Network's (NSN) prestigious Circle of Excellence Oracle Award. Baba Jamal has been featured at the National Storytelling Festivals,in Jonesborough, Tennessee, and in Washtington, D.C. at the Kennedy Center, Smithsonian museums, (including the recent opening of the African American Museum),National Storytelling Festivals, school systems, regional festivals , theaters, outdoor events and schools in Germany and Ghana, Mali, and South Africa. He holds the B.A., M.S., and Ed.S. degrees." "In Africa, there is a lake that is so still and so smooth, that every morning the people that live around that lake have to touch it to make sure it's still there. . ." "In America, there is a storyteller/ whose presence and views of cultural responsibility. . . needs to attend your school or community based organization . . .Baba Jamal Koram is his name. . ."
Baba Jamal uses simple stories to emphasize key ideas during his Drum Story/Drum Circle sessions, for youth to adults. There are different approaches, for joy, in this journey called life. BALANCE is key . The Drum brings balance. The Drum enables self-expression and discovery. In the circle we experience: BALANCE RHYTHM SOUND and COHESION Musically, Verbally and Inwardly. 1 hour sessions. Preliminary meeting with host facility/organization. "We listen to the elders. . .people like you inspire me. 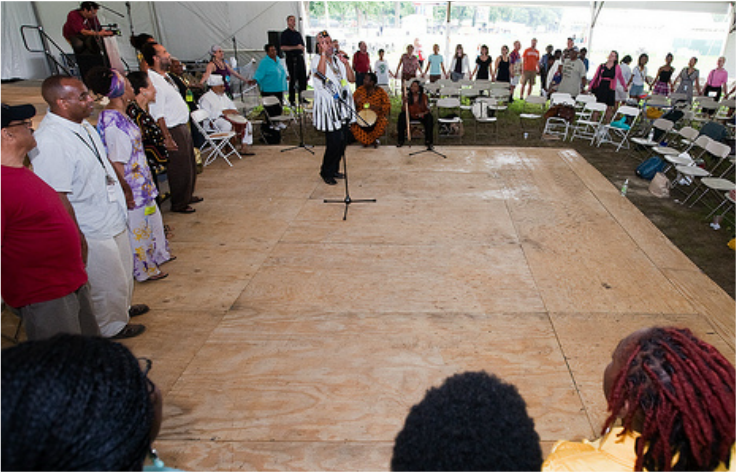 . ."
Baba Jamal Koram (center of circle) leading the closing love circle for the Smithsonian's 2009 Folklife Festival "Giving Voice, the Power of Words in African American Culture" in the Nation's Capital. 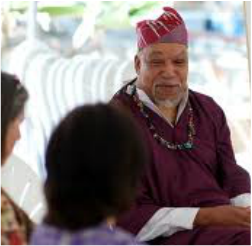 Baba Jamal Koram is a Cultural Systems Development Specialist (CSD); specializing in storytelling organization development and practice, and in integrated arts programs. His primary focus, however, is training storytellers to become conscious, capable, and competent in the presentation of the art of storytelling.